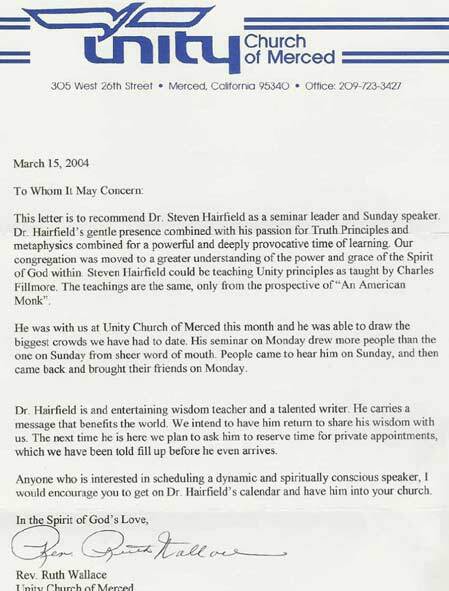 Unity of Decatur has been blessed to have experienced Dr. Steven Hairfield four times in the past three years. 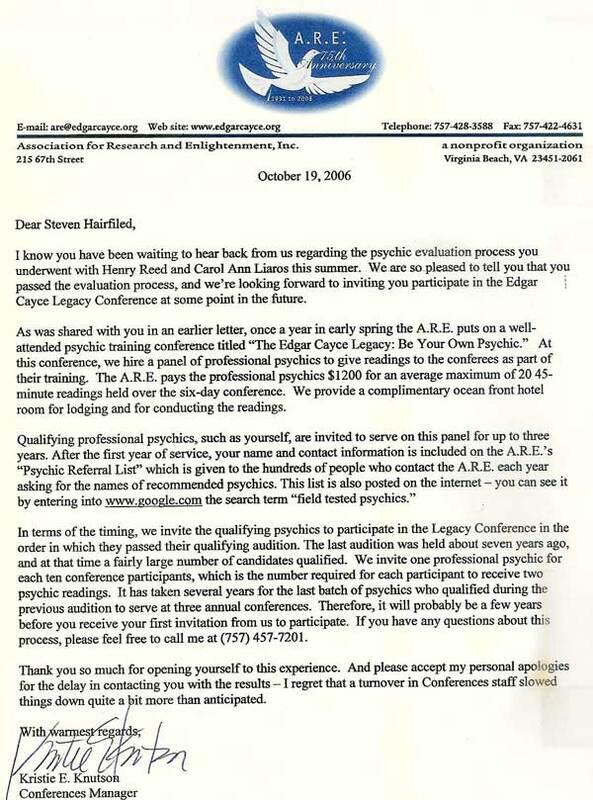 Dr. Hairfield's high quality presentations, the vast amount of useful & fascinating information he provides, his popularity with attendees, and the consciousness that he brings, easily explains why he has been invited to return again and again. This August, Dr. Hairfield is offering the same multi-day program at Unity of Peoria that he gave at Unity of Decatur in March 2005. I attended all of his events and thus highly recommend Dr. Hairfield, his superb workshops and talks. Dr. Hairfield brings a rare and illuminating perspective to any gathering, derived in part from his varied life-experiences of being a Vietnam soldier, to studying with Zen, Ishaya & Tibetan Monks and Native Americans, to receiving a doctorate in Metaphysics, and from his strong intuitive connection with Spirit. His range of knowledge, and the ability to deftly express it, will impress. All who are interested in stepping out of their every day routine and expanding into a higher consciousness, while achieving enhanced understanding of themselves and the world around them, are greatly encouraged to experience Dr. Steven Hairfield, An American Monk. I recall praying with you prior to our Sunday service and affirming that you would bring teachings to our spiritual family that would lead congregates to a higher level of understanding. Thank you for doing just that! The service at which you spoke and the two subsequent workshops, were the best attended we have offered. Your message, which is fully consistent with Unity teachings, places the responsibility and authority for our lives squarely where it belongs…on us. Added to that, your Eastern experiences and teachings provided another dimension that created a dynamic and positive learning environment. It is with sincere and heartfelt joy that I invite you back to our church home. Subject: an award for you!! Never underestimate the power of a kind word or thought. It may affect one or many, many people without you even knowing it. Even a gentle touch can make a huge difference. My friend Rick Jarrow was participating in an intensive Zen meditation retreat that required him to meditate many hours a day in rigorous conditions. One morning Rick decided this was just too hard, and he would leave the retreat after the morning silent walking meditation practice. During the walk, a student behind Rick gently placed his hand on Rick's shoulder. "In that touch," Rick told me, "I felt totally comforted and encouraged. It was as if my friend was saying, 'I know this is hard for you. I believe in you. You have what it takes to do this.' So I decided to stay, and I went on to gain tremendous strength from that retreat. That touch was the turning point." Steven I just wanted you to know the gift you have given me is your "touch"...your tenacity to not give up on me and walk beside me as I continually stumble with things coming to consciousness and your telling me "I have faith in you". There may not be such an award at this time period in history but I hope with the coming times and the message you are bringing across to the world that it will someday be acknowledged as much as the award for those responsible for breaking the sound barriers for jets or for the physicists who have broken the concept of time barriers that there are those out there like Steven Hairfield who more importantly interested in breaking people's Heart Barriers in order to learn the highest form of love, unconditional love. I Am forever indebted to you for this. I know I may be at the tip of my iceberg but I also know the kind of dedication and trust level it took on your part to even get close enough to my heart space to break this barrier, to get to some of my core stuff. I thank you for this. I officially award you a Purple Heart for bravery, tenacity and courage for breaking Steffanie Brown's Heart Barrier and for teaching me the kind of unconditional love Jesus exemplified that I've never gotten to experience before. Thanks for being a friend, teacher and healer in these times of my need. I hope you know I'm here for you too, if you ever need that reminder or could use a friend in any of these ways. Please continue to hold me high in consciousness so that I may rise to it as I sort through and integrate what comes back to me for wholeness in the midst of connecting my heart and head journey. Bless your heart for all you are doing for mankind! !